Click this link to download and save the firmware upgrade file. 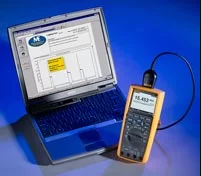 Ensure your Fluke 287 is connected to your computer using your Fluke USB-IR serial cable and run the file. Version 1.16 corrects an issue where recording sessions could be interrupted or terminated when using the record function in combination with ambient conditions of bright sunlight or other sources of bright light, when used without the IR cable attached. Version 1.16 does not apply for units labeled 287/TPWS or 287/NUC. Software licensing information that is required for the open-source software used is available here. Ensure your Fluke 289 is connected to your computer using your Fluke USB-IR serial cable and run the file. A Fluke USB-IR serial cable is required to upgrade your software. Don't have a cable? You can order an IR cable from your local Fluke distributor or directly from Fluke via Fluke Order Services at 800-993-5853. Outside the US, the IR cable can be ordered from your local Fluke distributor or from your local Fluke service center. Once you have received your cable you will need to return to download the firmware. Or save yourself some time and bookmark this page today to download firmware when you get it. Click on the appropriate link above based on if you purchased a 287 or 289 meter. To get the update you will need to register your product and then you will be provided with update instructions.